The first quarter meeting of the PNW District is being held October 27-28, 2017 in Kennewick,Washington and I have chosen not to attend, not because I have a conflicting appointment, but because it appears that my presence causes conflict for others. 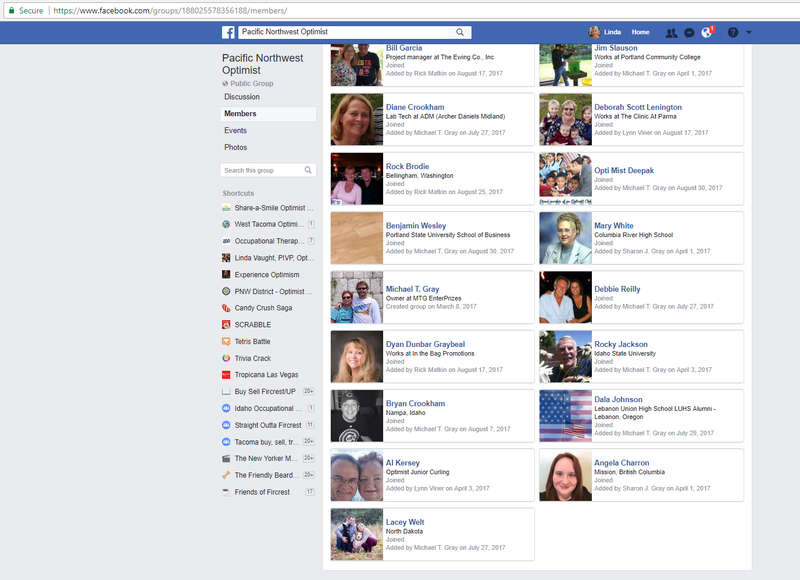 On October 1, as I researched Facebook to see if the district's immediate past governor had made any comments about the end of the year (he hadn't), I came upon a public group that calls itself Pacific Northwest Optimist. 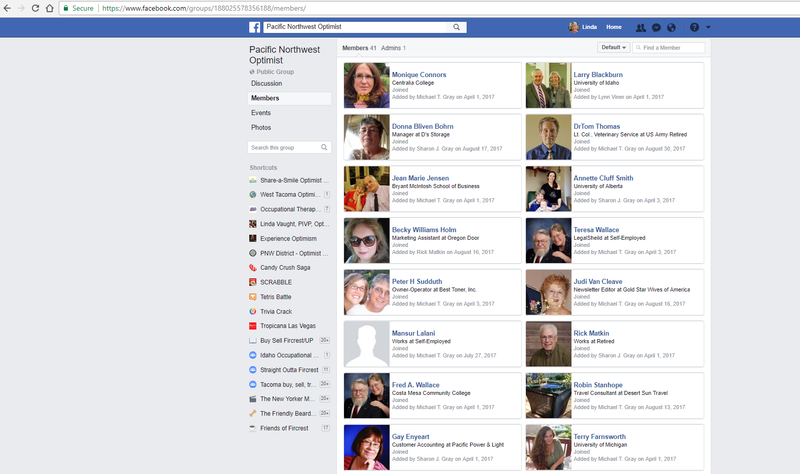 On the day that I looked, forty-one profiles were included in this group. They are shown to the right and you may click on the pictures to enlarge. As there are approximately 1,100 members in the Pacific Northwest District, I am not certain what one has to do to be included in this group. While I know most of the members, there are some I do not know, and others that do not reside in or belong to the district at all. 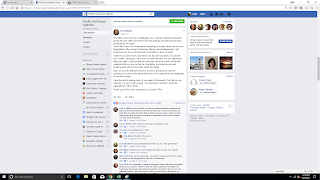 Regardless of how this group came to be and what legitimate purpose it was supposed to serve, I have decided to expose it for what it is. This is a hate group against me and the Optimist Clubs in the Pacific Northwest. What causes me to call it a hate group? 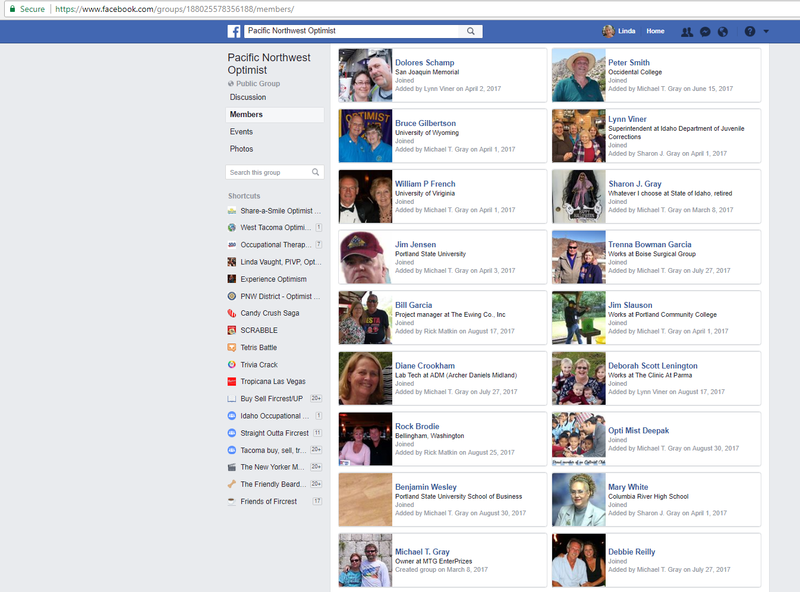 The posts that appear on the page as shown below. Again, please click on the posts to enlarge. The thread that concerns me begins quite innocuously, as the governor comments on the district meeting that has just concluded. It is followed, however, by a series of posts from people in leadership positions at the time, and some who remain in leadership positions today. Most troubling is the one that calls this website trash, and goes on to say it is written by trash. I'm a big girl, and I have big shoulders, so insults hurled by mean girls are not going keep me down. However, when individuals in administrative leadership positions of this district call the projects that our Optimist Clubs do TRASH, there is a problem and that problem must be addressed. There are 920 published posts on this website. Many discuss Optimist Club projects and programs. Some discuss leadership issues, including membership and program development. All have been written to help Optimist Clubs be more successful and to recognize clubs and individuals on their achievements. It appears that by publishing stories consistently for 10 years I have intimidated some who are not as successful as others. The Optimist Creed reminds us to be just as enthusiastic about the success of others as you are about your own. Please, in the future, do not call the achievements of others trash. It is said that evil persists when good people do nothing to stop it. From my viewpoint, that means about thirty-five people are complicit in an ongoing negative tirade against me as they have stood by and watched others insult the good work of the Optimist Clubs in the Pacific Northwest District. I've heard apologies from some and for that, I thank you. I also realize that some may not have ever seen this thread, even if they are members of the group, and if that is you, I apologize. However, it is time that this negativity be brought to light and stopped. We cannot stand by while "leaders" insult the work that we perform and the contributions that we make as Optimist Club members. If you are a member of this group who finds such negativity appalling, please leave it behind. 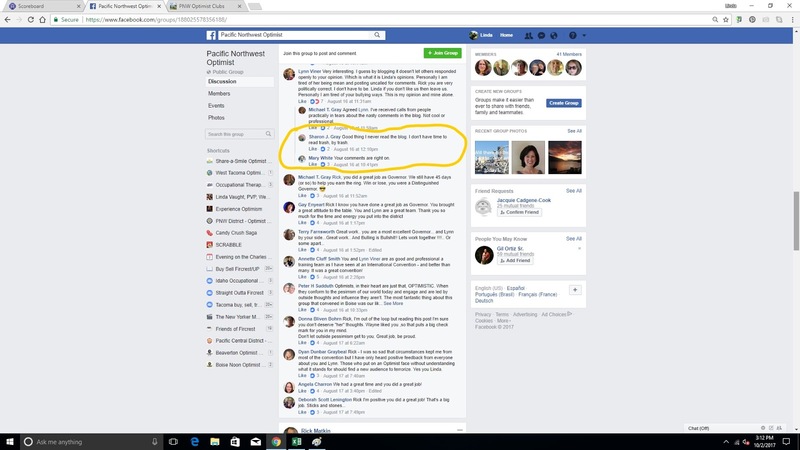 Go to Facebook now and click on "leave group." If you are the governor of this district, ask that this group cease and desist. It is doing nothing positive to help the district grow in service or members. I, and others, would like to see you ask for the resignations of those involved. If you are someone who thinks hurling insults at people behind their backs is fair play, please, I beg of you, consider joining a different organization. 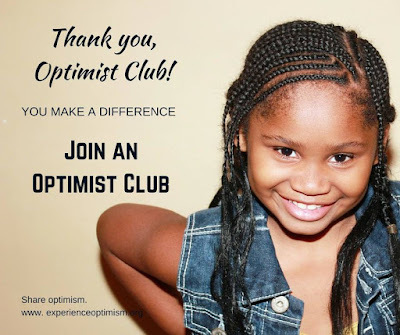 Calling yourself a member of an Optimist Club degrades the fine work that others are doing in the name of positive service with youth, our communities and ourselves. As for me, I will continue writing on this website because I'm kind of proud of the service I provide by archiving the positive achievements of Optimist Clubs in the Pacific Northwest. In the future, I probably won't choose to stay home from a district meeting because of a group of mean girls. I've taken a break from district service before and I came back to serve after hearing a speech by Past Optimist International President Ronnie Dunn. She said that we cannot let others stand in the way of what we can do, and what we can give, to help others reach their full potential. 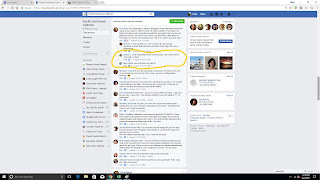 When she said it, I started this blog and then went on to become Governor of the PNW District, earning Distinguished District and Outstanding Governor designations. Several years later, I became Vice President for the West Coast Region. I am certain that my service in optimism is not complete. Look out, world! Look out, mean girls! I will be back. We serve our communities as members of an Optimist Club without expecting to be thanked. It's always a pleasant surprise when a youngster looks up and says, "Thank you!" That extra spark brightens the mood and the project of the day as it brings smiles to the faces of many. It's extra proof that what we do makes a difference. To inspire gratitude as we share optimism is a gift. That's why you should join an Optimist Club today. Click here to find the Optimist Club nearest to you. If you don't see one, we'd love to help you get one started in your community. Just drop us a note at the link. We're solidly into the 2017-2018 school year and eleven days into the new Optimist Club administrative year. What does that mean? It means that every Optimist Club should be thinking about the Optimist International Essay Contest. The annual contest begins at the Optimist Club level. Students under the age of 18 as of October 1, 2017 are invited to submit a 700 to 800 word essay on the topic: "Can Society Function Without Respect?" 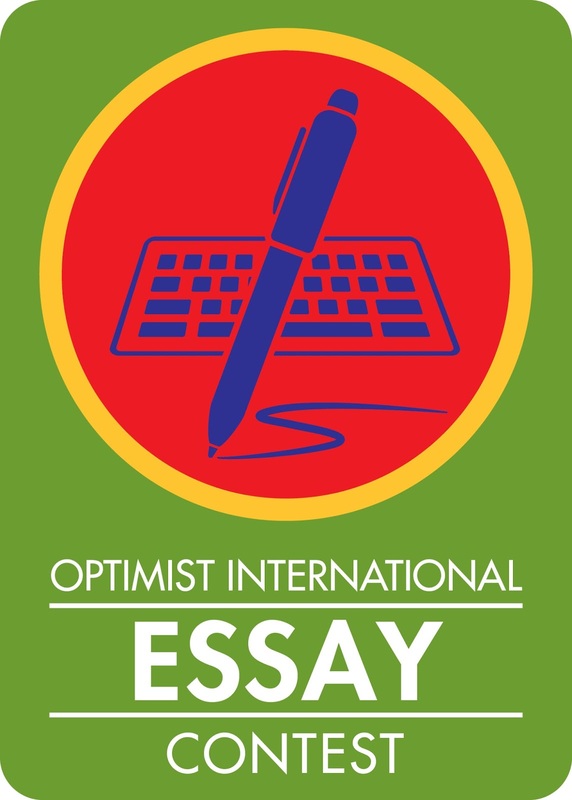 Complete rules for the Optimist International Essay Contest may be found here. 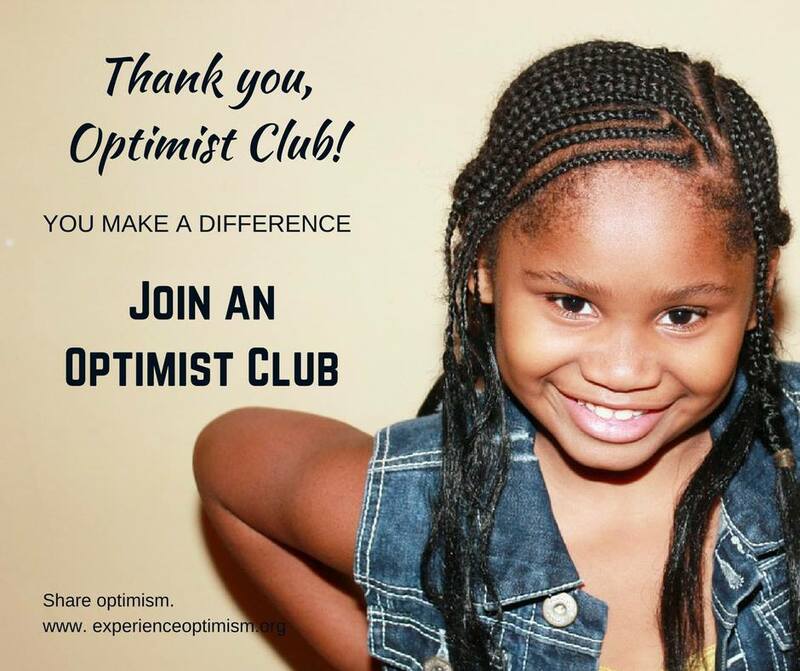 Click on this link to find an Optimist Club near you. Optimist Club presidents should delegate a member of their club to be the Club Essay Chairperson. A complete planning guide is available here. In the states of Alaska, Idaho, Oregon, Washington and the province of British Columbia, winning club entries should be forwarded to the PNW District Optimist International Essay Contest Chairperson Monique Connors by February 28, 2018. Contact Monique here or at 360.878.3886. As we start a new administrative year for Optimist International, it is a good time to restate the goals of this website and its sister website at experienceoptimism.com. The pnwdistrictoptimist.com and experienceoptimism.com websites exist to help publicize the good work of Optimist Clubs and Optimist Club members in the Pacific Northwest and around the world; illustrate and advise best practices in program and membership development; and to expand the reach of Optimist International, its mission, vision, and purposes through the creation of new Optimist Clubs. As is often advised in its stories, the authors try to utilize optimism in their approach; however, when we work only for the best, we must sometimes point out or highlight negative environments in order to improve upon them. When this occurs, it is meant to provoke discussion of ideas and not to criticize individuals. We belong to this organization in order to improve lives; not to to tear them down. We expect the same from others. The truth is hard to hear. The truth isn’t so obvious. The truth can’t be glossed over. The truth can’t be manufactured. The truth doesn’t take sides. 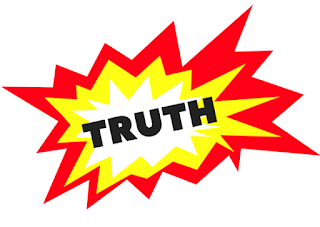 We are living in a politically charged and divisive world fueled by those who are quick to call something with which they disagree as fake or trash. We humbly ask that our readers seek the bigger picture and begin to work together to bring out the best in youth, community, and ourselves. In other words, readers, if the truth hurts, don't lay blame on the person who pointed out the truth; work together to fix it. Be #optimiststrong - make a difference. Make this world a better place in which to live. If you would like to discuss this post or this website, provide a story, or just say hi, please click here. Thank you. Optimist Club members get to say that popular, celebratory phrase twice every year. We say it on January 1 along with the rest of the world as we wish a Happy New Year, peace and prosperity to all. 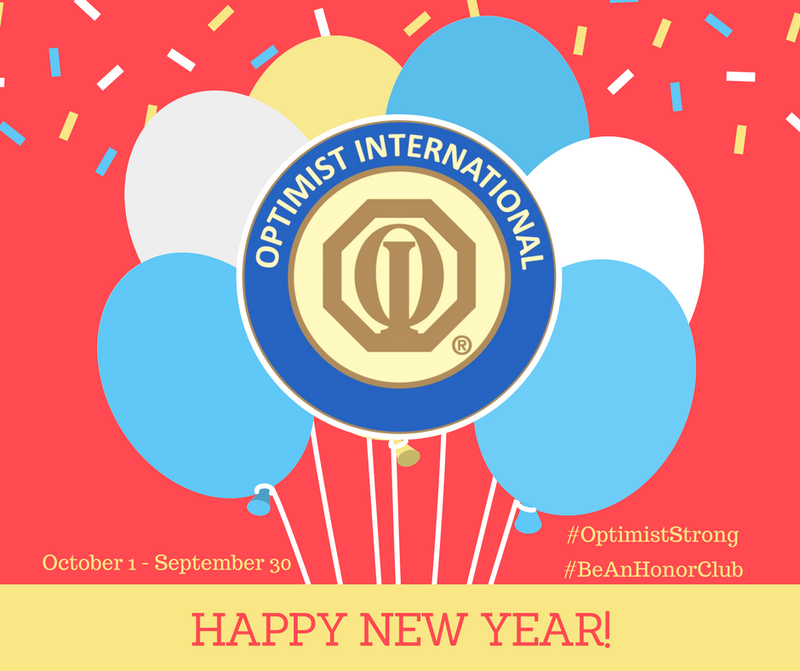 Then on October 1, we say it again as we wish a Happy New Year to all of our Optimist Club friends, colleagues, and participants in our Optimist Club programs. For the latter group, we also wish them health, happiness and prosperity along with all the other tenets of the Optimist Creed. We make a promise this day to be the best Optimist Club members we can be and to lead our clubs to success, for with hope and positive vision, Optimist Club members bring out the best in youth, community and ourselves.